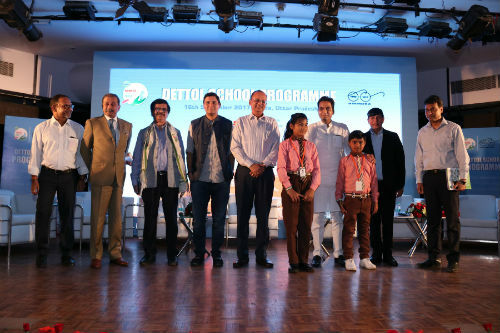 Noida: As part of its nationwide hygiene and sanitation campaign Dettol Banega Swachh India, RB India and Noida District Administration have joined hands to launch Hygiene Curriculum in 70 public schools across the city of Noida. The Curriculum was unveiled by Noida MLA Pankaj Singh and was represented by senior dignitaries from Noida District Administration, Hygiene Council of India, Aga Khan Foundation, RB and Jagran Pehel. Developed by RB India in partnership with Butterfly Fields and XSEED this curriculum has key elements like Hygiene in School, home, neighbourhood, personal Hygiene and Hygiene during illness. Curriculum has 15 sessions per year along with teacher work books and games developed under guidance of Dr Abdul Kalam. Curriculum has three levels with 45 sessions in total for three years. It is meant to cover primary secondary schools kids and strengthen behaviour Change on Hygiene and Sanitation. In school children parliament will be formed so, that children rights to Hygiene can be ensured by young champions – School Students with bottomline Sabka Saath Sabka Vikas. In Noida alone, over 70 schools will be trained to conduct Behaviour Change Communication sessions for school children from Class I to V. In line with WASH delivery model.